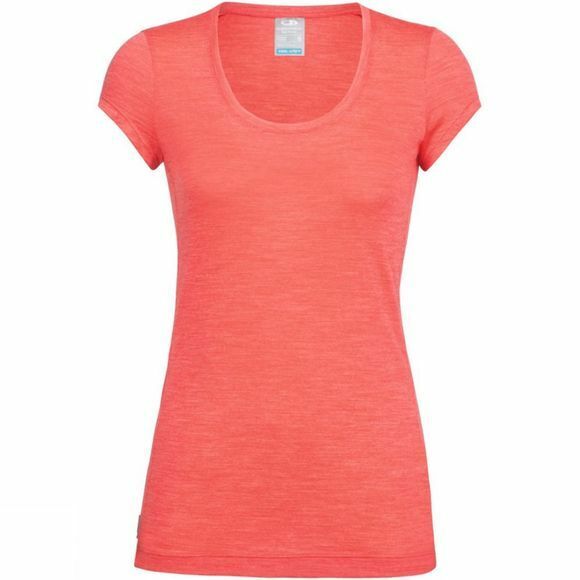 The Sphere Short Sleeve Scoop Top from Icebreaker is a modern daily merino wool T-shirt that packs as much flattering style as it does soft comfort, the Sphere Short Sleeve Scoop is a summertime wardrobe staple. Our Cool-Lite™ jersey fabric blends natural Tencel with our corespun fibers—nylon threads wrapped in merino wool for the ultimate combination of softness, breathability and durability. The deep feminine scoop neck, cap-sleeve construction and offset shoulder seams provide total warm-weather comfort with a versatile look. Awarded ‘Best in Category’ by Ultra Running Magazine for Wool Running Tops.